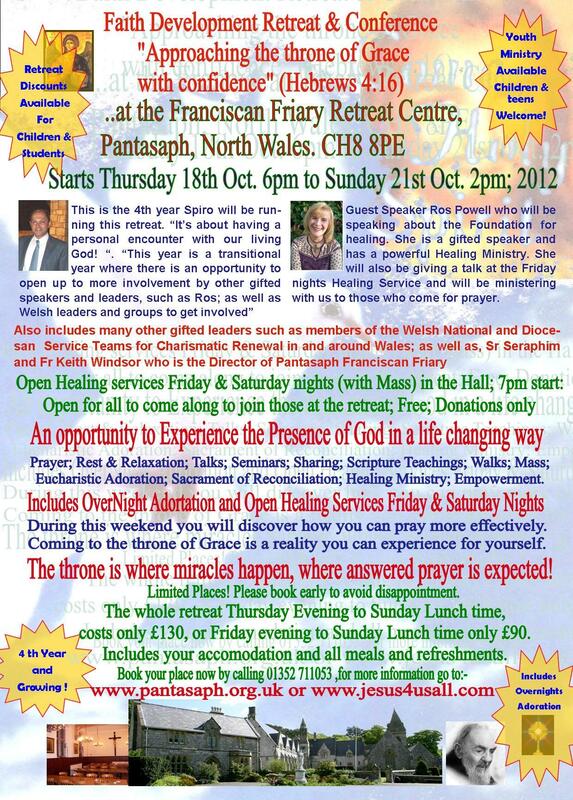 See also the Open Healing Service, scheduled for Friday and Saturday nights, during this retreat. The Open Healing Service is FREE, donation only, for all who come and you do not need to be booked into the retreat to attend. In the past people have come from Ireland, as well as from Manchester, Birmingham, Bedford and London, as well as from all around Wales. All are welcome to this open Healing Service, not just those who attend the Retreat, and it's free to come, donations only. Cost to attend the weekend retreat is only £90 for Friday evening to Sunday and £130 for Thursday evning to Sunday afternoon. This includes your own room, all meals and refreshments. See poster for more details. Please book directly with the Pantasaph Retreat Centre. Limited spaced only, please book early so as not to be disappointed since people are already booking early to ensure a place. It was decided by Fr Keith Windsor, the Retreat Director to extend the retreat an extra day as people were arriving for prayer even as we were leaving on the Sunday afternoon. 2012 is a transitional year for us at these retreats as now that they are an extra day we have prayed and discerned what the Lord wants us to do there? Following much prayer and reflection I believe the Lord wants us to move towards a conference type of retreat. Where other guest speakers can join in and where Welsh leaders and upcoming leaders can find a platform from which to use their charisms, their gifts given to us all from the Holy Spirit for the building up of God's people, the Church. We have therefore asked Ros Powell to come along and to give talks as a guest speaker. In addition to this Sr Seraphim will be joining us. A virtuous nun who lives as a hermit but has a powerful healing and deliverance ministry as well as authoring many books. We will also be having Fr Keith to guide and assist us throughout the retreat as well as provide for our spiritual needs, through the Sacraments of the Church. God willing we were hoping that Myles Dempsey can also make a special guest apearance on the Saturday where he would be addressing us with his wisdom on the theme of faith. We pray and hope he makes a quick and full recovery following his eye surgery. Other leaders around Wales are expected to come also from all three Dioceses; Such as my the National Chair for Charismatic Renewal in Wales and members of the National Service Team, such as Brunhild, Margaret, and myself. 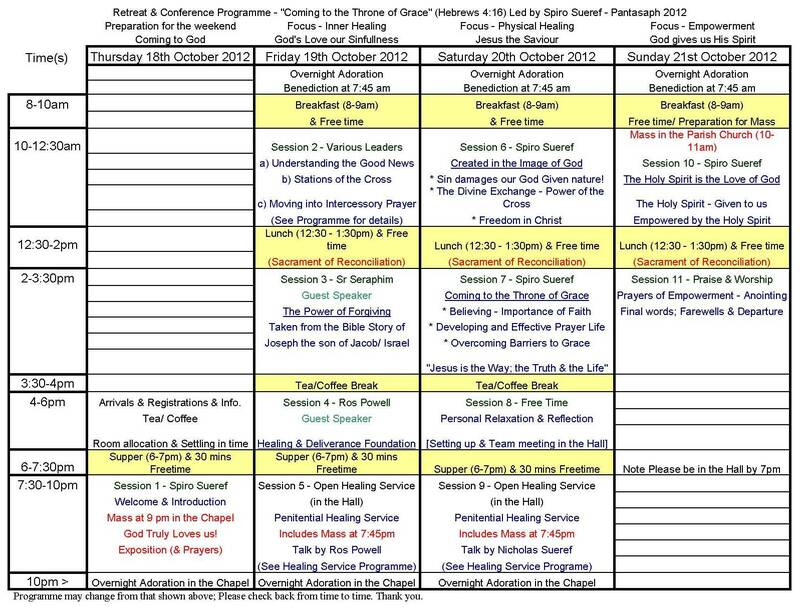 This year promises to be a transitional year that takes what has been till now an ordinary retreat to becoming a conference. Go to the Pantasaph Retreat Centre website for more details on how to book yourself in for this weekend retreat. Spiro's Life-changing experience in prayer and encounter with god! Imagine an ordinary prayer time that becomes a life-changing encounter with our living God! This is what happened to Spiro on 4th February 2001. As he sat and paced praying and contemplating asking and seeking the Lord for some pressing issues in his life the Holy Spirit began to guide his prayers, guiding him from repentance and into the real tangible presence of God where, His presence was so powerful, Spiro had to take pen to paper to write down what the Lord was speaking to him, in answer to his questions! What began as an ordinary prayer session turned out to be a life changing experience. Even the way Spiro prayed changed, not longer did he pray to a God who was distant but to a caring and loving God who was close at hand and within reach. What normally took 1 hour to pray, turned out to be a 4 hour prayer session with God; and by the end of it, Spiro was on fire with the Holy Spirit. He had never experienced prayer like this before! God showed him how to pray effectively and more importantly how pray was not a monologue but a dialogue with our Living and Almightly God! Moreover the transforming grace imparted to him during this encounter with God transformed Spiro from the inside out; Lifted Spiro into a new realm of living and being. Spiro, who has been a prayer group leader in Cardiff for over 10 years now, now uses his experience and encounter with God, through prayer, to guide others to move towards God in the right way, and with the right attitude of faith and trust in our loving God, through Jesus Christ. Many people have commented on feeling the tangible presence of God during prayer, and still many others have experienced healings and blessings of one kind or another. This retreat, takes the experience Spiro has gained over the last few years and provides a structured programme on guiding people into the presence of God. "Coming to the Throne of Grace"; taken from Hebrews 4:16 is a practical journey in the spirit to the very throne room of Almighty God. Knowing how to come there the right way, and knowing that once there our Mercifull Lord is more than able to change any situation in your life. He has the Power and the Authority over everything! ... and more importantly He loves you and cares for you. 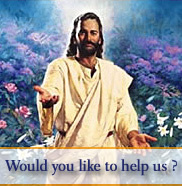 He wants to help you! All He asks is that you search Him with all your heart and that you come to Him through the way of Mercy, which is Jesus Christ. Jesus is the Way, the Truth and the Life, and coming through him to the Father means you must do so with a sincere heart and in oberdience to Jesus, which is the Word of God. All the sessions in the Retreat are designed to prepare you for this Life-Changing encounter with our all-loving and all-powerful God who asks that you Trust and Believe in the One He has sent, that is, Jesus.... and to believe in Jesus is to know God's love for you, and in that knowledge there is now more fear, nothing to cause you to be anxious, just an overwhelming feeling of His real love and concern for you. Are you ready to encounter Almighty God in a new and real way? a life changing way? where Miracles are possible? and troubles subside as you see God's hand working in your life for you and not against you. We look forward to seeing you there...... and for what God has prepared for you to recieve there. There are Daily Mass and Confessions, talks and sharing, praise and worship, and periods of silence and reflection; The blessed sacrament is exposed overnight and people will be praying for your intentions before the Lord. Expect God to move for you and we pray that you will recieve every grace and blessing, and become a new person by the end of this amazing retreat. Coming to the retreat? Here's how to prepare so you are able to recieve more! 3. Take time to reflect on anyone that has hurt you in the past and be determined that you will not only forgive them but will try to love them again, if only as an intention. 4. If you lived the wrong way make a determined effort to turn away from the errors of the past and to prepare for a new life with Christ. 5. Go to confession before you come, though you will have an opportunity to go confession at the retreat, but take some time to be honest with yourself (and God) about your own sins and failings. 6. Try to perform some acts of mercy, show someone forgiveness who you would normally hold a grudge against.... do good to them instead, for the sake of Jesus. Do something good and avoid doing bad..... learn to become sensitive to God's righteousness, not what you thiink is right or wrong but what God considers to be right or wrong...especially if you own conscious has been troubling you over doing something that is good and right but you have been putting it off, or excusing it away.